After putting it off for three years, I've decided to tackle a promise I made to take on some "manly" challenges, as seen in the photo below. 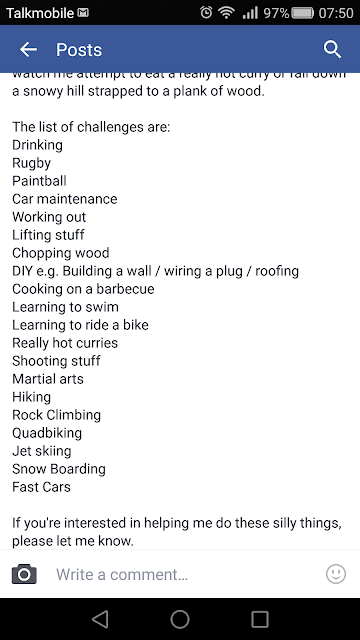 The aim is to do all of these by my thirty fourth birthday on July 30th, and write up my experiences into a book which ideally will be taken by a publisher and made into a best seller, but more likely will be self published on Amazon, or failing that will simply make some content for my blog. Now, some of these need some extra detail. For example "Drinking" - I don't mean just drinking a large amount of alcohol, I'm thinking some sort of drinking game. For many of the other activities there should be some sort of particular challenge that I can take on. I'm working on ideas for these, but if you have any thoughts of what I could do - perhaps you live in the Yorkshire area and might be willing to facilitate/come along for some of them - do drop me a line in the comments. Good luck, that's quite a list! Unfortunately I'm in Cornwall so can't come along to any of the challenges. It might be worth checking out what the BTCV have going on in your area as then you might get to chop wood and build a wall and help the countryside at the same time. Maybe it means drinking the expensive single malt stuff?